Up Here festival and We Live Up Here have created and curated over 28 new murals in Sudbury since the summer of 2013. Here are the projects that we've done thanks to the generous support of our friends at Barrydowne Paint and Equipment World. Got a wall that can use some colour? Submit it for our team’s consideration. 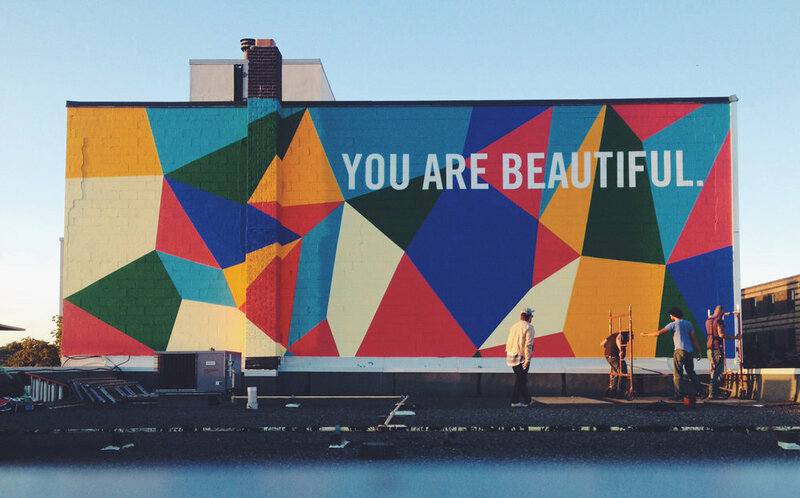 You Are Beautiful is part of a global campaign instigated by one man, Matthew Hoffman from the US, and described as a simple, powerful statement aspiring to create moments of positive self-realization. Sudbury is beautiful. We wanted to remind people of that. This first mural on Durham street downtown built community pride, inspired love for our ever-evolving core and added a little colour to our award-winning winters. We setup at the Market on August 10th and 11th 2013 for one weekend only to create a temporary mural for the 2013 season. We took photos of Sudburians, printed them and then pasted them around the Market on the retail units. Ordinary citizens owning the public space in an extraordinary way. We wanted to ask people to think about the way that they move, about the way that they interact with their city’s landscape, about biking, about public transportation, about driving. Sudbury loves their cars. They always have. We found a great article from The Sudbury Star from June 1954 advertising speedway races. We blew it up to larger-than-life size and put it one the Kingsway. This public artwork is the result of collaboration between Carrefour francophone and We Live Up Here. It salutes the pioneering contributions of the former St-Joseph’s Hospital through the eyes of nurses and doctors who worked there. Built atop “Mount St. Joseph”, St. Joseph’s Hospital was Sudbury’s first public hospital (the successor to Dr. Longfellow’s private hospital). It was founded by the Grey Nuns of the Cross of Ottawa in 1898 at the Jesuits’ request following a typhoid epidemic. In 1911, the St. Elizabeth’s School of Nursing was established in the hospital building as well. In 1975, St. Joseph’s Hospital closed its doors. The Centre des jeunes de Sudbury (today called Carrefour francophone) purchased the building in 1978, which it renovated and used for its activities from 1981 to 2004. Afterward, the real estate developer Dalron converted the century-old building into a seniors’ residence called Red Oak Villa. Cette oeuvre d’art publique est le fruit d’une collaboration entre le Carrefour francophone et le collectif We Live Up Here. Elle salue la contribution des pionniers de l’ancien Hôpital St-Joseph à travers les yeux d’infirmières et de médecins qui y ont travaillé. Situé sur le « mont St-Joseph », l’Hôpital St-Joseph, le premier hôpital public de Sudbury (succédant à l’hôpital privé du Dr Longfellow), a été fondé par les Soeurs grises de la Croix d’Ottawa en 1898 à l’invitation des Jésuites en réaction à une épidémie de fièvre typhoïde. En 1911, l’école de formation des infirmières de l’hôpital (le St. Elizabeth’s School of Nursing en anglais) est fondée et s’installe à l’hôpital même. En 1975, l’Hôpital St-Joseph ferme ses portes. Le Centre des jeunes de Sudbury (aujourd’hui le Carrefour francophone) acquiert l’édifice en 1978, puis l’aménage et anime les lieux de 1981 à 2004. Le promoteur immobilier Dalron convertit ensuite l’édifice centenaire en résidence pour personnes âgées nommé le Red Oak Villa. 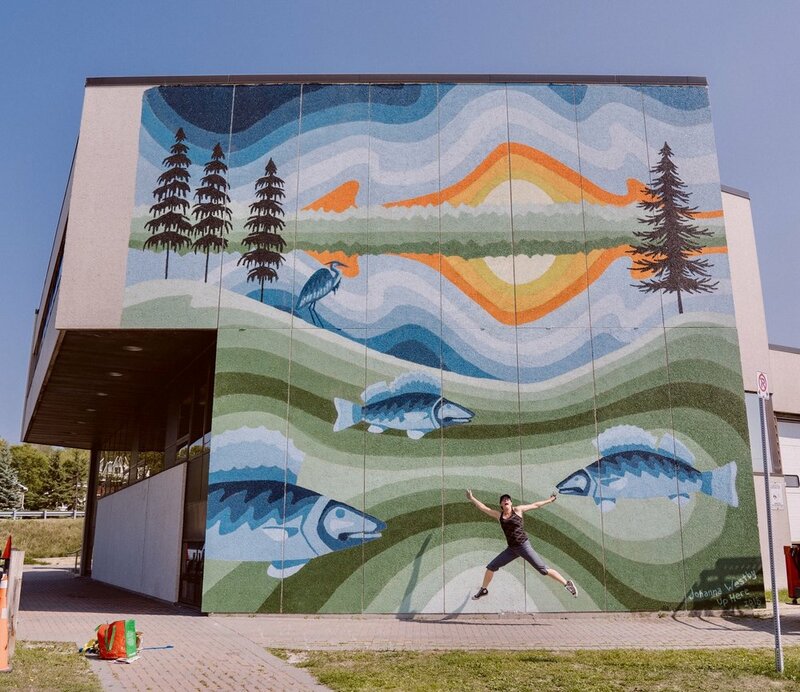 This mural by Sudbury artist Alexandra Berens-Firth is part of a larger typographic project referencing historical iconography and hand-painted signage from the Sudbury area. This piece references the familiar “ICE” signs of corner stores and is meant to act as a landmark for the southern entrance of Downtown Sudbury. Alexandra Mackenzie's work and ethos stretches far beyond the canvas. With influence ranging from her inner most experiences to the outermost perspectives, Alexandra’s work transcends sights, sounds, and realms beyond interpretation. Who's going to take the weight? The Montreal based artist creates familiar characters that are seamlessly abstracted by the various colour palettes. His work showcases human life on an intimate and personal level. Labrona collaborated with Gawd, his friend and creative partner, to create this colourful and imaginative piece. The blue chevron represents our lakes. The black represents our black rock. The green represents our re-greening projects. The brown, silver and copper represents our mines. The woman represents mother nature. The trees represent life & hope. Finally, the antlers represent the Sudbury artist’s Métis roots and our connection to the animal world. Trevor Wheatley’s work ranges from murals to transforming everyday slang & expressions into large scale word installations and murals. This piece takes on its full meaning in the dead of winter when the parking lot occasional below turns into an impromptu skating rink. 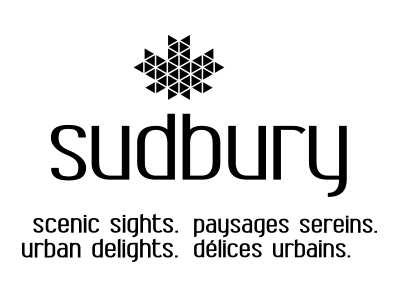 This piece prompted local writer Maty Ralph to write an eloquent piece on our blog. Check out Words about Art and Art about Words. Over tea, Troy's grandma told stories of little men that would come and dance for you but as you clapped they tricked you. Troy Lovegates (AKA Other) is a story-teller at heart with a nomadic spirit who's work is inspired by people he's met on his travels around the world. What once was an empty lot, later operated as a brewery for decades, and later became abandoned and neglected, will hopefully one day be renovated and the space will transform into something new, once again. It won't be the last thing that stands there and it certainly isn't the first. This Too Will Change. Sometimes it's a "Hi" or a "Hello" or a "No one likes Jackson Pollock", but you need to start somewhere to end anywhere. That initial spark can come from any moment, a spark that can change it all for you. It's just up to you to decided to strive for it. 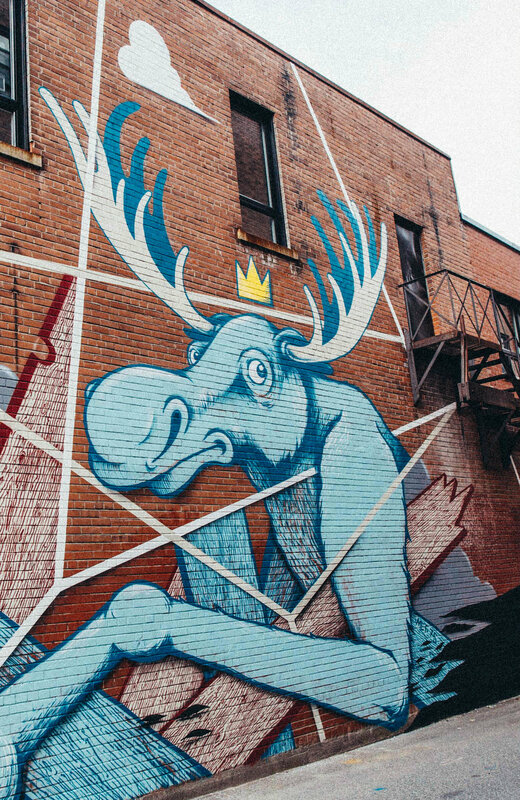 This mural by Sudbury artist Nico Glaude is an ode to hitting it off. You might recognize Sudbury artist Tracy Baker's work from the book "The Awful Alphabet" she published back in January with Josh Turnbull. Illustrator, designer, author — Baker is kind of a triple threat. This Cambrian College alum always seems to find a way to incorporate a sense of nostalgia, warmth and playfulness into her work, and you'll likely find yourself cracking a smile at her character-based designs. This piece is inspired by some of the groundbreaking research in neuroscience that's done right here in Sudbury by Dr Michael Persinger at Laurentian University. French (as in France) artists Ella & Pitr began making a name for themselves in the mid-2000s in Paris. Since then, their penchant for optical illusions and perspective can be found on murals in city's around the planet. They are perhaps best known for their roof-top murals and massive Sleeping Giant series, extremely large murals of people sleeping. One of the largest, the 225,000-square-foot "Lillith & Olaf," is largest mural event made in Norway. Vancouver, B.C. 's Ola Volo hails from Kazakhstan originally and infuses her art with elements drawn from history, multiculturalism and folklore. Particularly intricate, her winding works tell stories by bringing together animals, people, architecture and nature in pieces rich with symbolism. 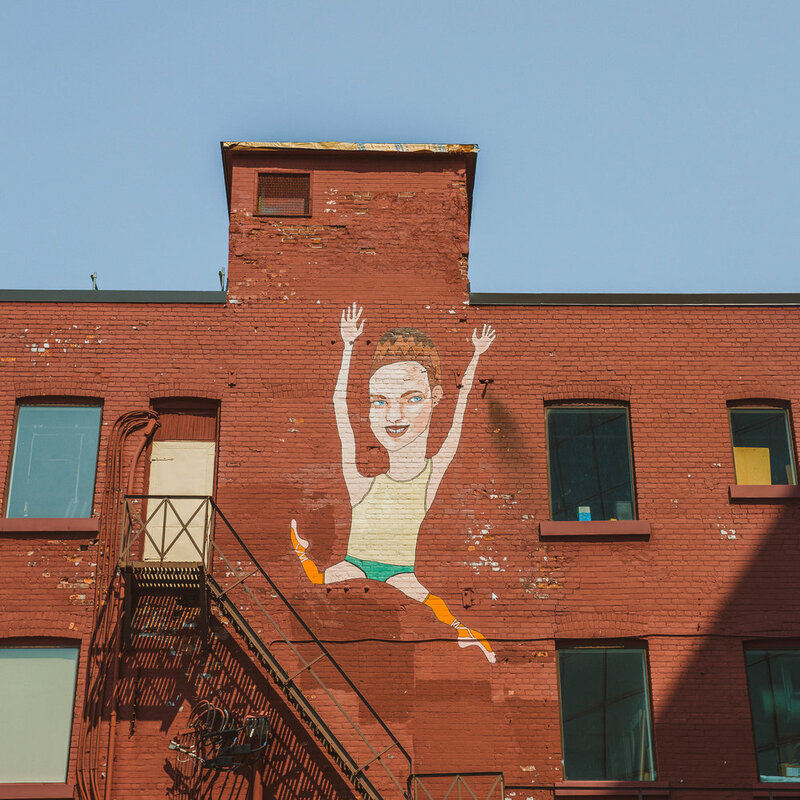 Volo's work can be seen in outdoor spaces around Vancouver and she's done commissions for clients including HootSuite, Vancouver Opera and LuluLemon. An eclectic contemporary piece overlooking Elm Street in downtown Sudbury. Born in London, Ont., in 1977, James Kirkpatrick has exhibited extensively throughout the U.S. and Canada with shows in New York, Boston, Los Angeles, San Francisco, Miami, Halifax, Toronto and Vancouver. His interest in art in public spaces saw him participate in the early days of the Canadian graffiti movement. Kirkpatrick is always pushing the envelope and also creates works under his avant-garde hip-hop moniker "Thesis Sahib," working in a variety of media including drawing, painting, sculpture, zines, mask-making and experimental sound improvisation. In recent years, his work has incorporated sculptural, kinetic and auditory elements. Kirsten Mccrea lives in Toronto by way of Montreal, where she first honed her in that city's collaborative art scene, crafting both indoor and outdoor pieces. In 2009, McCrea founded the affordable art subscription Papirmass, which has mailed over 50,000 art prints around the world for less than the cost of lunch. Named a Top-30-Under-30 artist by Blouin Artinfo, her work has exhibited in Toronto’s AGO, Montreal’s Musée des Beaux Arts, and many other galleries, and has appeared on the Today Show and GIRLS, and in The Globe and Mail, Canadian Art, The National Post, and BUST Magazine. Beauty and grace motivate Neli's art. With this mural Neli wanted to remind the audience driving by every day that beauty is all around us. The Superstack, the Big Nickel, the Water Tower (next to the mural) are all symbols of Ontario’s north that should treasure for they form our lives up here. They also make our reality unique by reminding us of the human achievement contrasting and highlighting nature. Nature represented by the female form, the girl, the wife, the mother carries the tenderness, care and support that nurtures love and life. It is the woman with her smile, gentle touch and heart that warms even the coldest of nights. The man lurking in the darkness of the underground cherishes the luminous thoughts of the loved one above, the miner for whom all pains and labors are the greatest rewards if they only make those closest, those living and working in the world up there happy. Connecting the masculine and feminine of the two worlds, connecting nature and industry, connecting light and darkness closes the circle of life reinforcing beauty, hope and love. This mural celebrates the togetherness in all aspects of life; the togetherness that surmounts all perils, all hurdles, and all obstacles of our northern, harsh but beautiful winters; the togetherness that make living Up Here worthwhile. Before she became a Cambrian College graphic design student, Bulgarian-born Neli Nenkova spent 15 years as a visual artist in Europe and in North America. Her work is held in private and public collections in France, Bulgaria, Italy, Germany, Greece, the U.S., Japan, Turkey, The Vatican and Canada. She says her work is influenced by the Italian master of the High Renaissance and the ideas of the Surrealist movement -- quite the combination. Mr. Hobz (a.k.a Benoit Robin) started out in the Parisian graffiti and street art scene in the mid 1990s, but in the intervening 20 years has taken his work inside as well as out, exhibiting in solo and group exhibitions around France and around the world. Saying he takes inspiration from such varied pop-culture touchstones as Conan the Barbarian, Terminator, Supervixens and Franco-Belgian comics magazine Fluide Glacial, Hobz has developed a singular eye for unique composition. He lives and works in Paris, France. Jarus came to Sudbury to trace a bit of his family's history. His grandfather worked underground at Falconbridge. He visited the Sudbury Archives in Falconbridge, little Italy in Copper Cliff and went underground at Dynamic Earth. He heard stories upon stories but one story really resonated and stood out. The story was told to us in 2013. It's the story of the first woman on payroll at Inco. It's a story of strength and resilience. It's a story about a mother with a big heart and rough hands who challenged the status quo. Finally, it's a compelling story that's not ours to tell, but we hope will be told at the right time. This piece is a nod to that story, and to the many women who work underground.